After you create an event on the VoiceBoxer portal, you can assign one or more operators for the event. Following the preview step of the event creation and after pressing “Finalize”, you will get an overview of the event (details, link, speakers and so on). In the upper right corner of the events page there is a “Settings” button that once pressed will redirect you to the page where you can assign an operator. You can add operators by inserting their email address. An assigned operator must have a VoiceBoxer account already. If not, they can create a new account on our sign-up page. Learn more about how to use the operator console here. 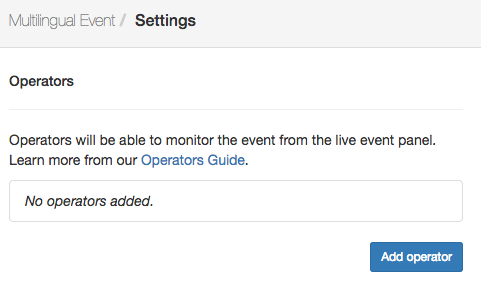 Click on “Add operator”, insert their email address and learn more about the their role throughout the event. Operators are able to monitor a running event and to access all the video and audio streams, even when the presenters and interpreters are not active. If you want to add an operator later on, you can do so by entering the portal where you will find all your upcoming events. Click on the event you want to add operator/s to and you will get an overview of the event and the “Settings” tab on the upper right corner. Click on it and follow the steps mentioned above.above.